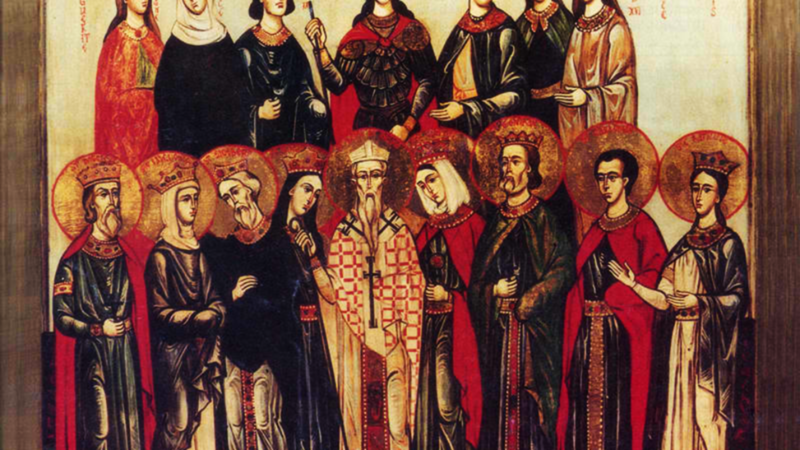 ACISCLUS and VICTORIA, (Fourth Century), according to most sources they were brother and sister and natives of Cordoba, who were martyred in 304, most likely during the Diocletianic Persecution. There are some sources however, who place their martyrdom at some time in the fourth century and aver that St. Victoria might be apocryphal. Both, however, are commemorated in the Mozarabic liturgy. ANIANUS (AIGNAN), a native of Vienne (32 kilometres / 20 mi south of Lyon), living there as a hermit for some time before going to Orléans where he was ordained and then succeeded to the bishopric of the diocese. St. Anianus is best remembered for working with General Flavius Aetius and his army in the defence of the Orléans against Attila the Hun in 451. St. Anianus reposed in 453. EUGENE, a disciple of St. Ambrose at Milan (7th December), who went on to serve as a deacon in Florence under St. Zenobius (25th May). St. Eugene reposed in 422. GREGORY of TOURS, a member of a Gallo-Roman aristocratic family, related to at least a dozen prelates, one of the most important historians of his era, theologian, and nineteenth Bishop of Tours. St. Gregory is the main contemporary source for Merovingian history. His most notable work was his Decem Libri Historiarumor (Ten Books of Histories) , often referred to as Historia Francorum (History of the Franks) by later writers. St. Gregory also wrote several volumes on the miracles of St. Martin of Tours (11th November). During his time as bishop, He oversaw an increase in the number of churches, restored the church of St. Perpetuus (8th April), and rebuilt the Cathedral of Saint-Maurice (of the Theban Legion 22nd September), which had been burnt down in 561. After an episcopacy of twenty-one years, St. Gregory reposed in 594. HILD (HILDA) Our venerable Mother Hild, best known as St. Hilda of Whitby, was an abbess, foundress of a monastery and school. Lauded by St. Bede the Venerable (25th May) for her skills as a spiritual mother and counsellor whose advice was solicited by leaders both temporal and spiritual of her day. St. Hilda was also acclaimed for her aptitude as an administrator; and the rule she created for Whitby. St. Hilda’s significance notwithstanding, other than St. Bede the Venerable’s (25th May) extensive writings about her in the Historia ecclesiastica gentis Anglorum , little was written about her. According to St. Bede the Venerable, St. Hilda, the younger sister of St. Hereswith (3rd September ), was born in 614, and was baptised, by St. Paulinus of York (10th October) at the age of 13, on Easter Sunday (12th April) 627. Nothing seems to be known about her life from baptism until 647 when, following the example of her sister St. Hereswith who, upon the repose of her husband, had received monastic tonsure at the Abbaye Notre-Dame-des-Chelles in present-day Meaux (approximately 40 km / 25 mi.) north-east of Paris), St. Hilda set off to enter the Abbey at Chelles. St. Hilda had only made it as far as East Anglia when St. Aidan of Lindisfarne (31st August) summoned her to return and blessed her to enter the double monastery of Hartlepool Abbey (in present-day Hartlepool, County Durham, England) where he tonsured her. As nicely as this account flows, it is problematic as Chelles couldn’t have been founded before 648, and is generally said to have been founded circa 658. Most likely St. Bede the Venerable’s sources confounded Chelles with either the Abbaye Notre Dame de Jouarre (founded circa 620 – 630), or the Abbaye Notre-Dame de Faremoutiers (founded circa 620). Faremoutiers was not only was the first double monastery in France, it also counted several English princesses amongst its members in the mid-seventh century. At Hartlepool St. Hilda learnt the traditions of Celtic monasticism, which St. Aidan brought from Iona. St. Aidan appointed St. Hilda the second Abbess following the departure of St. Hieu (2nd September) for Tadcaster in 649. As Abbess of Hartlepool, St. Hilda fostered close relations with the Northumbrian religious élite, and is said to have been visited regularly by St. Aidan and others. On 15th November 655, seeking divine aid against the pagan Penda at the Battle of Winwæd, King Oswiu of Northumbria made vows to God; including pledging twelve estates to the Church on which to establish monasteries. Following his victory, Oswiu fulfilled his vows, and two years later, St. Aidan assigned St. Hilda the task of establishing a double monastery on the estate located at Streanæshalch (later named Whitby by the Danes). This monastery quickly rose in prominence, due, in no small part, to its school, which produced many greats of the Church including St. Bosa (9th March), fourth Bishop of York; St. John of Beverley (7th May), fifth Bishop of Hexham and fifth Bishop of York; St. Wilfrid the Younger (29th April), sixth Bishop of York; as well as Ætla, third Bishop of Dorchester; and Oftfor, second Bishop of Worcester. In 664, the acclaimed Synod of Whitby, was convened by Oswiu primarily to settle the Paschal Controversy. Despite her close ties with the Roman mission, St. Hilda had spent her entire monastic life following the Celtic practices taught to her by St. Aidan, and hence supported St. Colmán of Lindisfarne’s (18th February) defence of them at the Synod. It has been suggested St. Hilda allied herself with the Celtic side not so much out of deep personal conviction, but due to her friendship with St. Aidan coupled with a rapidly increasing hostility to the young St. Wilfrid (23rd June) who was the spokesman for the supporters of the Roman practices. However, when the decision was made in favour of the Roman practices, St. Hilda faithfully accepted it. Beginning in 669 Whitby developed ever closer ties with the school at Canterbury which had been established by Archbishop St. Theodore of Canterbury (19th September). There can be little doubt that the bond between SS. Hilda and Theodore was nourished in part by their mutual animosity towards St. Wilfrid, who was by this time Bishop of York. For the last six years of her life, St. Hilda suffered from an unspecified illness which ultimately led to her repose. However, it did not slow her down, and in her last year she even led the establishment of a dependant monastery at Hackness, some 25 km (15 mi.) from Whitby. On 17th November 680, after receiving viaticum, St. Hilda fell asleep in the Lord at Whitby. St. Hilda’s feast is kept on 17th November (the date of her repose) on Western calendars, that of the Moscow Patriarchate, and Greek Orthodox Archdiocese of America, however the Calendar of the Greek Orthodox Archdiocese of Thyateira and Great Britain lists her feast as 25th August, the date of the translation and deposition of her relics. NAMASIUS (NAAMAT, NAMAT, NAMATIUS), the twenty-fifth Bishop of Vienne. He reposed circa 599. Nothing further seems to be known of his life.